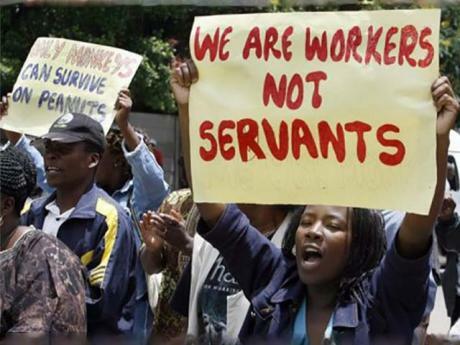 As desperation to quell civil unrest intensifies, government has tightened screws on civil servants after it forced them to sign forms stating that they would not participate in future stay-aways and strikes. This follows last week’s successful nationwide shutdown co-ordinated by #ThisFlag and work stoppages over salary delays. It also comes as the Public Service Commission is planning to deduct one-day salaries for civil servants who heeded the stay-away call by #ThisFlag frontman Evan Mawarire. Apex Council president Cecilia Alexander said these moves were calculated to intimidate workers. The Apex Council brings together all civil servants representative bodies. Government workers, who spoke to the Zimbabwe Independent, also said employees of some government ministries were on Monday asked to fill in questionnaires on bond notes, which will be introduced in October to curb the cash crisis. “We were made to sign forms; making vows that we will not participate in any strikes or stay-aways. It was intimidation at its best. As we were filling the forms we were under the guard of senior officials who were making sure that no one takes pictures of the forms. They wanted to keep the process under wraps. We were even told if the forms leaked some people will be dismissed,” said a Public Service ministry employee. Alexander said the Apex Council had engaged government over the intimidation tactics and threats not to pay full salaries. “Yes there were civil servants who had their salaries withdrawn following the job action last week, and it’s everyone who took part in the job action who was affected, but this has since been rectified following submissions made by Apex Council at a meeting on Monday,” she said. Last week the Apex Council warned it would take “stern action” against “elements” whom it accused of victimising its members who did not report to work, when the nation heeded the stay-away call. Apex council singled out civil service inspectors, accusing them of harassing and intimidating government workers. “The Apex Council and Health Apex Council take exception to reports of harassment and intimidation of members by so-called Civil Service Inspectors, with some among our leadership having reported of being followed by suspicious elements,” the Apex Council and Health Apex Council said in a joint statement.